A long, thin pepper resembling a banana in shape and color. Banana peppers are a type of chili pepper that are sweet to moderately hot in flavor. Banana peppers can be used to flavor a variety of dishes and are most often pickled and served on sandwiches. Banana peppers are yellow in color and small and elongated. Often pickled. Choosing: Buy in a jar, already pickled. Or choose a plump, yellow, unpickled one. Buying: They are available at grocery stores and sandwich shoppes. 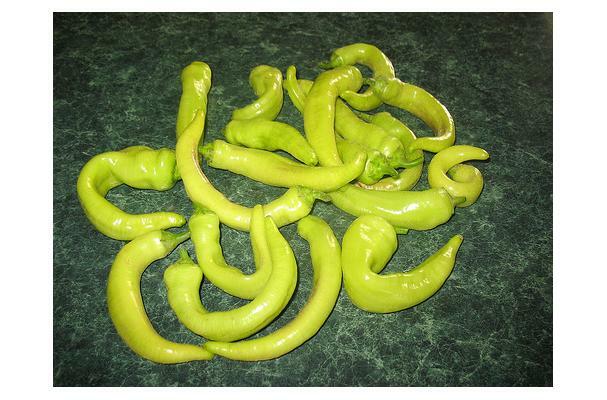 Procuring: You can grow your own banana peppers in your garden, provided you live in a temperature that is moderate. Usually, they are pickled and sliced. Cleaning: Use warm, soapy water and rinse thoroughly. Store in jars to pickle. History: They have made sandwiches more lively and flavorful throughout history.